These settings are the basic settings to setup your software. They include business information details, Bill payment integration, alerts printer and tax settings, Batch shift and register settings, login/ security settings repair settings and other important settings. Click on the Admin Tools. Click on the drop down menu of settings. Enter your business information such as store name and DBA name. Upload a logo picture to appear on the receipts by clicking on the Add logo button and uploading a PNG or JPG picture file of size 3X1 inches. Enter your contact information phone number, fax number, and E-mail address. Transaction: Set walk-in customer by default, sets all the clients in the software as walk-in. However, you can enter their name on the dashboard or while checking the customer out. Close E-pay payment screen after payment option closes the e-pay screen after the payment is complete. Adjustment: This option when selected, shows you items that are removed in the inventory adjustment as a loss in the profit and loss reports including the target light report. 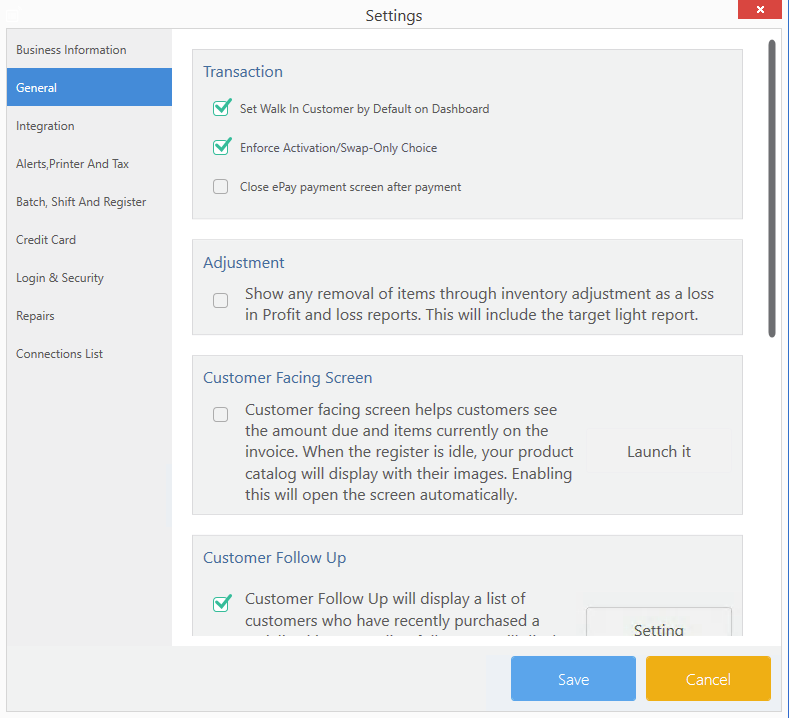 Customer facing screen: This option allows your customers to view the items in the invoice with their images. Customer Follow-up: Customer follow up will display a list of customers who have recently purchased a serialized item. Pending follow-ups will display within the notification bar at the bottom. This option allows you to set up to three reminders. For each reminder, you can set the number of days and enter any notes in the script box. Optional: you can also select Purchase anniversary follow-ups to follow up every year after the customer made a purchase, and force to add a customer response in the follow-up. Click save after making any changes. Commission: Enabling commission allows you to track employee commissions based on the templates that are assigned to each employee. The commission bank will also become visible showing you pending and total commissions. Click on the Commission icon. Enter the commission template name in the field. Enter the availability by clicking on the top , bottom arrows given. Note: The availability is simply when the commission becomes available. Point Rate: This allows you to set your point rate which is used to give points to your clients when they purchase items from your store. You can create points templates for different categories and set different point rates for each. These points can be used at checkout. Click on the Blue plus icon. Select the category of the item your want to give points on through the drop-down menu. The point rate will be visible in the bottom of the window. Restock: Enter a restocking fee as a percentage amount, and a default return policy. The default return policy sets a time period after any item is sold where a customer can return the item. Attempting to return an item after the default return date will show a warning. Boost Mobile Upgrade Check: By enabling this option you will get notified when a customer is eligible for a phone upgrade after a certain period of time. You can click on the settings button to sign in into your account and once the system is integrated, the Software will do its job in notifying you. Click here to set-up this option. Boost Mobile Deals: Enable this option to print the current boost mobile deals at the end of the bill payment receipt. Report Email: These emails are used to send closing batch email reports. You can set up to five email addresses to send reports. Click on the email settings button and enter up to five different email addresses in the fields and click save. Sale Alert: Sales Alerts allows you to receive SMS notifications to the provided phone numbers with information about store activity. Enter your Phone number or E-mail Address in the 1st Alert by toggling the Text or Email button and select the carrier. Optional: Enter a second Phone number or email address in the 2nd Alert and select the carrier. Toggle the alerts on or off and enter the alert times for when you want the alerts to be sent to your phone or email. Optional: Toggle the Yellow, green light alerts on and the store open, deleted items alerts if necessary. Optional: You can test the alerts by clicking on the test alert button. Printer: Setup your printers by clicking on the printer settings button and changing the settings according to the printers you are using. Tax: Set up taxes by clicking on the tax settings button. Shift: Open every shift with a fixed cash amount, opens each shift with a fixed amount that you enter. Do not allow the shift to close when there are pending payments or invoices, does not close the shift when any there are any pending invoices. Batch: Set whether you want to see the total amount of the current shift or batch when viewing the credit card total while the closing shift. Toggle the Batch/shift button to switch between options. Register Setup: View and edit register names by clicking on the settings button. Register name will be shown when closing the shift and on shift closing receipts. Set up your credit card terminal by entering the merchant ID and password. You can also apply for a credit card processor via Mercury. Click on apply to apply for a credit card processor. Select from the options given that work the most for your store and edit user roles by clicking on the templates button. Select from the options given for repairs and manage your repairs related devices, issues, status, and types that are used when creating repair tickets. Click on Manage to manage the repairs.